Gender fluidity conveys a wider, more flexible range of gender expression, with interests and behaviors that may even change from day to day. 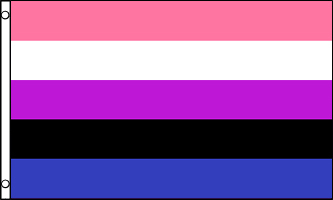 Gender fluid people do not feel confined by restrictive boundaries of stereotypical expectations of women and men. For some people, gender fluidity extends beyond behavior and interests, and actually serves to specifically define their gender identity. In other words, a person may feel they are more female on some days and more male on others, or possibly feel that neither term describes them accurately. Their identity is seen as being gender fluid.